In a charming natural atmosphere surrounded by beautiful tea gardens, at the initiative of a few distinguished educationists with active co-operation of the people of the locality, fulfilling the needs of higher education in rural area in outskirt of Jorhat city, about 25 km east along 37, National Highway; Chandra Kamal Bezbaruah (C.K.B.) College, Teok was established in the year 1959. Enlightening many minds in the field of education for half of a century with continued improvement making higher education affordable to the poor and under privileged; C.K.B. College, Teok reached its golden year and echoing Amlokhi Chapori with enchanting programmes the College observed the Closing Ceremony of Golden Jubilee celebration during 1st to 3rd February, 2014. 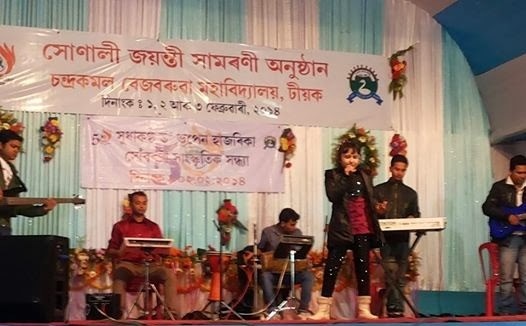 Under the dynamic guidance of the College principal, Dr. Jaigeswar Borah, the entire events scheduled for Closing Ceremony was successfully organized and concluded the Golden Jubilee celebration effectively for five years where countless enthusiastic people of the area joined in all the days appreciably. Some of the event videos are available on YouTube, to watch may please click 1 2 3 4 5 6. In a deliberate manner the Closing Ceremony of the five years’ Golden Jubilee celebration of C.K.B. College, Teok was started on 1st February, 2014 at Amlokhi Chapori with various programmes including hoisting the flag by Shri Tileswar Phukan, executive president of organizing committee who is also the president of the managing committee; tree plantation, starting tribute to martyrdom by Shri Membor Gogoi, MLA and president of organizing committee, felicitation and releasing Souvenir ‘SWARNAKAMAL’ by Dr. Krishnakumar Mishra, retired principal of Sivasagar College. The editor of the Souvenir is Prof. Narendranath Saikia. Besides, three more books were released after the release of the Golden Jubilee Souvenir, such as, from the department of economics, “Media and Society” edited by Dr. Rubi Nath; from the department of history, “Entrepreneurship Development in India” edited by Dr. Ranjit Ranjan Saikia and ‘Indus’ edited by Dr. Tridip Mahanta. An important educational discussion led by Dr. Pobitrapran Goswami, retired principal of Jorhat College, was held in the afternoon session to discuss about standard of higher education prevailing in Assam where Shri Binod Bora, Deputy Registrar of Dibrugarh University and Shri Rana Changma, president of Assam College Teachers’Association (ACTA) joined the panel discussion. The first day schedule was concluded with the beautiful cultural programmes in the evening. Early in the morning on 2nd February, 2014, Shri Rukheswar Nath, retired principal-in-charge, C.K.B. College, Teok and Dr. Akan Ch. Saikia, retired principal, Kakojan College, Jorhat jointly inaugurated the colourful cultural possession. Manifesting “Unity among Diversity” the procession was participated by various cultural troupes representing different backgrounds of rich cultural heritage of Assam spreading sense of brotherhood and belongingness among the communities. In the second half of the day, the Open Session was started with a chorus song performed by teaching and non-teaching staff with students of the College. Shri Pradip Baruah may be credited for his contribution for the meaningful lyrics and composition of the chorus song which has been decided to set on as Theme Song of C.K.B. College, Teok (Watch on YouTube) permanently by the College authority. The open session let by Prof. Mamoni Gogoi welcomed the dignitaries to the dais. All the dignitaries were felicitated by Prof. Karabi Dutta, vice principal; Dr. Anubha Bordoloi and Dr. Karabi Gogoi one by one. Shri Membor Gogoi, local MLA presided over the meeting. Dr. Ranjit Ranjan Saikia conveyed the purpose of the open session. The dynamic principal, Dr. Jaigeswar Borah delivered his inaugural speech. He remembered the 50th years’ historical journey of the college. He first acknowledged the contribution of the former principals along with the public. He also expressed his heartiest thankfulness to the donor of the college, Late Chandrakamal Bezbaruah and his family members who were present in the meeting. In his speech, Dr. Borah stated that he never claimed any credit for the present development of college, but instead, he offered full credit to the teaching and non-teaching staff along with students for bringing the College in the forefront of academic account in Assam. An eminent intellectual person and one of the members of the donor family, Shri Dhirendra Nath Bezbaruah stated in his speech that Chandra Kamal Bezbaruah left his education at class 9th standard due to financial crisis. Circumstances compelled him to follow business. Though he was not able to carry his educational journey, yet he could understand the value of education. Therefore he emphasized more in educating his sons and established a number of educational institutions in Jorhat district. Shri Dhirendra Nath Bezbaruah expressed his happiness to see the satisfactory development of the college at golden jubilee stage. Grand-son Shri Pravat Kamal Bezbaruah said that golden jubilee is a foundation where an institution can prepare their future vision or planning. He requested the college authority to formulate some employment oriented curriculums besides the main syllabi. General Secretary, Assam College Teachers’ Association (ACTA), Shri Jyoti Kamal Hazarika congratulated the principal, teaching & non-teaching staff for reaching the momentum like golden jubilee. Further he manifested some specific kind of problems pertaining to higher education. Other dignitaries also put their valuable speech in the meeting. In due course, after Vote of Thanks, the meeting concluded with the speech by the chairperson. In the night, the main attraction of cultural programme was performance of the renowned folk singer Shri Bipul Chetia Phukan and child artist Harsita Utpal. Little Harsita is now a popular name in the cultural field as child artist in Assam. She is presently anchoring in a TV Reality Show in Dy365 channel with programme title “DY Bihu Konwari 2014”. Besides, she likes modeling and dancing also. Originally hails from Jagduar locality near Teok, Jorhat district, little Harsita is a versatile child with talent in multiple fields including singing, anchoring, modeling, dancing, etc. Hence, it is our pleasure to wish her bright future. A scene of the play "Sakunir Pratisudh"
In the morning session on 3rd February, 2014, Nam-Kirtan was arranged praying for blessings for the onward development of the College. In the night, Bhaona Sabha was arranged where the members college teachers’ fraternity played different roles in the bhaona “Sakunir Pratisudh” (Watch on YouTube). This Bhaona was directed by Shri Krishna Pad Kalita and some of the ex-students of the college were joined the Bhaona as Gayon (Singer) and Bayon (Khul Badak), etc. The different roles played by the teachers are: Khailyo by Dr. Jaigeswar Borah, Principal of the College, Shri Krishna by Dr. (Prof.) Debananda Baruah, Yudhishtir by Prof. Robin Saikia, Bhim by Prof. Sunil Bhattacharyya, Arjun by Prof. Junti Baruah, Nakul by Dr. (Prof.) Binoy Brata RajKhowa, Sahadeva by Prof. Dhrubajyoti Bora, Draupadi by Prof. Nizara Baruah, Dhritarastra by Prof. Benu Bora, Gandhari by Prof. Geeta sarmah, Durjyodhana by Prof. Narendranath Saikia, Dukhasana by Prof. Keshab Hazarika, Sukuni by Prof. Paragdhar Bora, Karna by Dr. (Prof.) Ranjit Ranjan Saikia, Kunti by Prof. Ranju Devi and Padma by Prof. Chitra Duwarah. C.K. B. College, Teok is now a full-fledged forward educational institution with some permanent and modern infrastructural set-ups, such as, modern class room, administrative block, girls’ hostel, guest house, indoor and outdoor stadium, etc. The College presently offers Graduate and Under-graduate courses in both Arts and Commerce streams. Besides, self-financing courses like Cutting & Sewing, Computer Basic & DTP and career oriented courses like Spoken English and Beauty Care are offered. C.K.B. College, Teok located almost at equidistance from Jorhat and Sivasagar city is well connected by bus along 37, National Highway. Some of the event videos are available on YouTube, to watch may please click 1 2 3 4 5 6.